Poulenc’s Trio for Oboe, Bassoon and Piano, Martinů’s Musique de chambre No. 1, and Penderecki’s Quartet for Clarinet and String Trio, featuring Richard Woodhams, oboe, Donald Montanaro, clarinet, Bernard Garfield, bassoon, and Kiyoko Takeuti, piano. 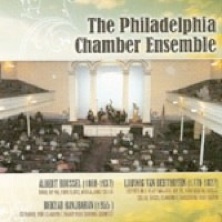 Brahms’s Trio in A minor, Bruch’s Four Pieces for clarinet, cello and piano, and Mozart’s Trio in E-flat Major, with Donald Montanaro, clarinet, Burchard Tang, viola, William Stokking, cello and Kiyoko Takeuti, piano. 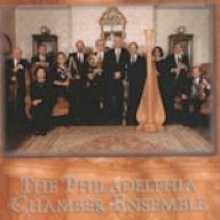 Rousell’s Trio for flute, viola, and cello, the world premiere performance of Ranjabaran’s Isfahan, and Beethoven’s Septet in E-flat major, featuring Michael Ludwig, violin, Yumi Ninomiya Scott, violin, Burchard Tang, viola, John Koen, cello, Michael Shahan, bass, David Cramer, flute, Donald Montanaro, clarinet, Mark Gigliotti, Bassoon, Nolan Miller, horn, and Margarita Montanaro, harp. 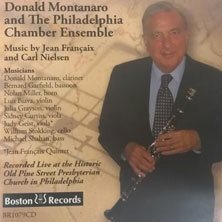 Françaix‘ Quintet for clarinet and string quartet; Nielsen’s Serenata in vano for clarinet, bassoon, horn, cello and double bass and Françaix’ Octet for clarinet, bassoon, horn, two violins, viola, cello and double bass, featuring Donald Montanaro, clarinet, Bernard Garfield, bassoon, Nolan Miller, horn, Luis Biava, violin, Julia Grayson, violin, Sidney Curtiss, viola, Judy Geist, viola, William Stokking, cello, and Michael Shahan, bass.